The infamous Romulan Bird of Prey, with which the Romulans emerged to test the Federation in 2266 with a daring single ship cross-border raid. Although the ship was destroyed by USS ENTERPRISE (NCC-1701), it showed itself to be a formidable combat vessel when skilfully handled. Unlike most previous Romulan ships, which had clearly distinguished command and engineering sections, the CRICKET class had a single teardrop shaped hull. Despite this the fusion reactor was still a horizontal tokomak and the impulse drive remained in a wide housing at the rear of the ship. 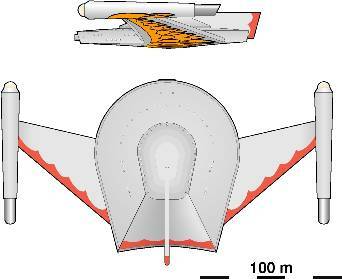 The fusion powered nacelles were separated from the hull on wide 65-m-long wings.